Blockstone customer Alex Wenham is an award winning carver. 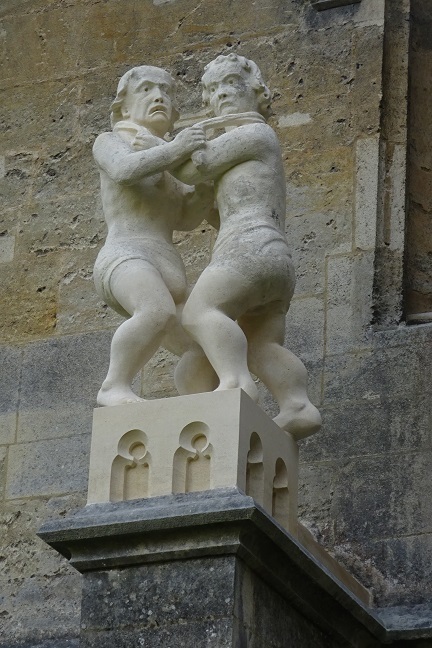 Winner of the European Stone Festival three times, Alex has been using Cadeby Limestone to repair the wrestlers at Magdalen college. The building and possibly the statues date back to the early 16th century and the wrestlers were in imminent danger of collapse. It is unsure what the original stone was but probably of local origin and very similar to Bathstone. Alex did not think the use of Bath Stone or Clipsham would be appropriate although a good visual match he didn’t think they would be strong enough. In the end Cadeby limestone was chosen, from Doncaster. “It’s much firmer than Bath Stone,” says Alex. The plinth and the legs were carved from a single block of Cadeby.